You’re tired of working for money and have decided you want money working for you. You want a monthly income stream that doesn’t require you to be anywhere on a schedule. You want the income stream to be safe, dependable, tax-free, in your control, grow in value over time, and be something real you can touch and feel–unlike digits in a bank account or pieces of paper that claim to have value. You want to buy a mobile home park with little or no money down. 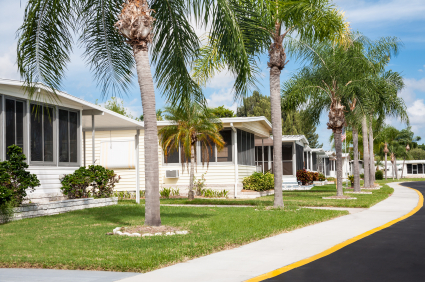 Here’s how to buy a mobile home park without using bank financing. You want to buy a mobile home park because it fulfills all those desires. And you want to buy it with little or no money down. But how to finance it? Most banks today require larger down payments, shorter loan terms, and tougher qualifications for approval. Their over-reaction to their self-caused real estate bubble has eliminated most buyers from gaining bank financing. Their loss. Banks are just one source of financing, and not nearly the best one. Here are other ways to fund a mobile home park purchase without using a bank. In my reading and experience, over 30% of all mobile home parks are owned free and clear. The seller of a mobile home park is familiar with its cash flow. He knows the park is profitable and will continue to be if operated well. He’s used to paying little or no taxes because of park depreciation and other business deductions. He certainly doesn’t want to sell the park for cash and face a giant capital gains tax. He just wants to retire from park responsibilities but keep the monthly income stream. What a coincidence! You want to take over his responsibilities and pay him a monthly payment that will minimize his tax liability and earn him a fair interest rate. So you just have to convince him you’ll make that payment and operate the park well. I bought a park with 28% cash down (I’d just sold another business) and the rest financed by the seller over 14.3 years. Why 28% down? The seller demanded it, and I wanted my cash in something I could control. Why 14.3 years? The seller needed a certain amount of income per month, so we set our monthly payment for that and let the amortization work itself out with the balance we owed. Our monthly payment is a bit higher than a loan amortized longer, but the park easily affords it, it made the seller happy to do the deal and, as a bonus, the park will be paid off pretty quickly. When we asked the seller how he established his asking price, he told us his financial planner told him that’s what he needed in cash to invest in mutual funds to earn a high enough return to get the monthly income he wanted. When we showed him the park’s net operating income (NOI) and how 10 times that was the normal sales price for mobile home parks, it showed he had listed the park for $300,000 more than it was worth. We then offered to make our monthly payment the exact amount of income he wanted and offered to pay the full 10 times NOI even though the park had a few issues. We also reminded him how many mutual funds had lost money. He’d have no security if he lost cash investments, but his investment in our 6.5% mortgage was secured by a mobile home park he knew produced good income. If we didn’t pay, he got his park and income stream back. If his mutual funds tanked, he’d get nothing back. He accepted our offer, which gave us a $300,000 price reduction and seller financing. No appraisal was required because no banks were used. He was happy, we were happy, and the deal closed quickly without all that ponderous bank paperwork. What if you don’t have 28% down payment in cash? Everything is negotiable. Motivated sellers may not require a down payment. Others will allow you to pay your down payment over time. Just negotiate the lowest possible amount and then spread it over 12, 24, or 36 months. Make quarterly payments in addition to the monthly mortgage payment you negotiated. Obviously the park has to pencil out to afford both payments. You may work for 1-3 years earning equity only, but that equity will still be worth many, many thousands of dollars. Once the down payment goes away, you earn equity AND monthly income. Sellers want something up front to get an immediate payday and to make sure you have enough skin in the game to stick with the deal. This doesn’t have to be cash. Do you have an RV, ATV, car, boat, time-share, vacant lot, cabin, second home, small business or other asset to trade? Do you have skills to trade? The more you learn about what the seller plans to do with the proceeds, the more you’re able to give him what he wants within the limits of what you have. Most park owners just want to be free of the tenants and park responsibilities. If you can’t convince them to sell you their park, try for a lease option. You agree to a future purchase price at a future date. But you take over the park immediately. You make a rent payment to the owner each month and take over all operations of the park and pay all the bills. You also collect all the income. If the park penciled out correctly, you’ll easily pay your rent and have monthly income left over. If you negotiate well, a portion of the monthly rent will be applied to your down payment at the purchase date. Lease the property for 1 to 5 years and you’ll earn enough income to pay any reasonable down payment at closing. Many investors say, “If you can’t touch it, you don’t own it.” Mobile home parks are one investment you can not only physically touch, you can physically control. I always recommend reading two books from Lonnie Scruggs, “Deals on Wheels” and “Making Money With Mobile Homes.” Both are available right on this website in the mobile home section. “Making Money With Mobile Homes” has a great chapter about Lonnie’s daughter buying a mobile home park on page 125. I read that chapter 50 times and it was a huge help to my first deal. I also recommend reading all the how-to articles and success stories on this site related to mobile homes and parks. I also have two other articles about mobile home parks on this blog area that were posted within the last month. Those articles have really good comments and responses that will help you significantly. I learned enough from Lonnie’s books and the articles on this site to buy my first mobile home park with just $1,000 down. Lonnie taught me to close on the 5th so I’d get the rest of that month’s pro-rated rents at closing (along with all security deposits held by seller). This amounted to over $6,000, which means I was PAID over $5,000 at closing to buy the park. When you have no money in the deal, your yield is infinite. Great article! Would you happen to have any suggestions for further reading about investors wanting to invest in mobile homes and mobile home parks? Me and my husband is looking to start a business in the field so that we can help out the workforce. Other than reading Lonnie Scruggs’ books and all the how-to and success stories on this website, you might try my new website PerpetualSaturday.com. I’m doing my best there to show people how saving and investing dollars and digits in paper is a losing proposition due to low returns, high inflation and unfair taxes. About the only good real investment left is buying income property with borrowed money. Better yet, you can just BUY an already existing, large enough income property and retire within 12 months. You can gain massive wealth and massive time in one fell swoop. You have an excellent ability to turn complicated material into easy to read (and fun) practical information. Is the picture provided above a picture of the park you purchase in the article? If so it looks beautiful! Did any homes convey in the sale? Thanks for the nice comments. The photos here are not my parks, they are stock photos added by the editor. My parks are filled with mostly 1970’s models, which is what you’re going to find in most available parks today. Few new parks are being built anymore because of ponderous regulations and the huge capital needed just to build a park full of empty lots that you then have to fill. Your money goes far farther buying existing, older parks that are already filled with tenants and providing a documented cash flow. These will include parks that only rent lots, parks that own all the dwellings and rent them, or a combination of both. Of my two parks, one owns 90% of the dwellings and the other park only owns 4% of the dwellings. Some parks also sell new and used homes. Many sell homes on “Lonnie Deals” where the park owner provides the financing. Older parks will not look nearly as pretty as the park pictured, but the homes park owners provide can be clean, painted and mechanically sound. Tenants appreciate the affordable rents and/or payments and know what they are getting before signing the lease. Reputable landlords treat their tenants with respect, screen applicants to keep bad neighbors out of the park and quickly respond to tenant requests and maintenance issues. I’ve had to realize there isn’t enough cash flow to make my older parks look like the photo above. But I can afford to provide sound, affordable housing at market rates and still earn a good income from doing so. Everybody wins! John Fedro, do you have a contact number or email? I am a Canadian living in Manitoba. there are no mobile home parks for sale in Manitoba.There are some in other provinces but if I have to travel long distances I would rather go south.do you have any suggestions where would be the best places to look.I am retired and have rental properties in Winnipeg. I suggest looking in North Dakota and Minnesota first, and South Dakota and Iowa next. These places have the lowest prices I’ve seen on mobile home parks and are closest to your location. Be aware that different states have different landlord requirements and different tax rates. Minnesota, for example, requires landlord licenses and has rules making evictions more difficult. North Dakota is experiencing an oil boom so affordable housing is in short supply around the oil fields. This is pushing workers to areas farther and farther away from the fields, where you might find attractively-priced parks. Sorry for delayed answer, I just saw your post. Both are available right on this website in the mobile home section. “Making Money With Mobile Homes” has a great chapter about Lonnie’s daughter buying a mobile home park on page 125. I read that chapter 50 times and it was a huge help to my first deal. Keep penciling out parks and visiting the ones that are priced at 10X Net Operating Income or less and still throw off a decent profit after a mortgage payment. Practice looking at many deals builds confidence too. I used this website, Lonnie’s books and practice deals to learn enough to get started. I think anyone with desire and self-discipline can educate themselves too. Hi, Mike, thank you for your inspiring. I understand people like parks with city sewers and water. Do you think if the parks with wells and spetic are still worth buying? How much roughly would cost to covert to city sewer and water? What’s the minimum population in the zip code where you buy your MHPs? Please advise. Thank you very much! Sorry for delay, I didn’t get a notice that you had posted and just saw your questions. Getting parks with city water and sewer can save you hundreds of thousands of dollars and years of regulatory hoops. I know this because my first park had a failing septic system when I bought it. Prepare for a horror story. I hired an engineer to size it up and he told me I could rebuild the tank & leach field system for $50,000. I could handle that so I bought the park. It turned out that due to being close to a river I could NOT replace the septic system. This forced me to buy a quarter-million dollar treatment system and maintain it forever, or find a way to hook to city sewer on other side of river, 1,400 feet away and 75 feet HIGHER than my location. $300K and five years of regulatory hoops later I finally hooked to city sewer. They trenched under the river and gave me a lift station to maintain. Luckily the old system limped along for 5 years while park rent increases caused enough appreciation to refinance and I was able to handle the larger mortgage payment. If your park is in a location away from waterways and with enough vacant land for more leach field, you might avoid what I faced. Luckily I was already on city water so I had no issues with that. I think my situation with the sewer is about the worst you could face, other than having NO solution and having to close down. Most conversions to city sewer should be far cheaper and far easier. But you do get good bargains buying parks on wells and septic fields, so don’t immediately eliminate them. You just have to know far more than a novice going in. It’s not a great idea to buy your first park on a well or septic due to the unknown risk. You have a steep enough learning curve already with everything else. I operate both my parks in a county of 28,000. One in a city of 10,000 and one in a town of 5,000. I don’t worry too much about population, I just look at the park’s rental history and current situation. Rich Dad suggests buying rentals where the jobs are in demand and that is good advice too. I’m writing to you as a new investor from Ottawa.Canada. I never thought of buying a mobile park, I did think of buying a mobile home as part of my retirement. My in-laws go to Mission Texas every year for six months since they hate winters here in Canada. We visit them every year and stay with them in their park. After reading your article, I will seriously consider buying a mobile park as part of my investment portfolio. I retire from my government job in six years giving me 36 years of service. My plan is to retire sooner and live in Texas during the winters. Leasing or buying a mobile park sounds very interesting. I will definitely learn as much as I can and will read the recommended books. If you know any contacts in Mission, McAllen or Brownsburg, southern Texas it would be greatly appreciate. Angel Pride Property Investors Inc. I don’t have much knowledge of Texas and no contacts there yet. But it’s on my list to learn more. I love the state’s independent attitude and mild winters. Congrats on your long career and all the best with your self-education and retirement plans. When I’m negotiating with park sellers I always ask how they plan on using the proceeds. This helps me make an offer that works for everyone. Most sellers start negotiations wanting all the cash at closing. But where will they put all that cash that is safe and gets a good return? If they invest it in stocks and stocks go down, they have nothing. If they invest the money in a first or second mortgage with you, they’ll earn 5-6% (negotiable) and if you don’t pay, they get their income stream back (the park). A mortgage to you is far more secure and generates more income for the seller. I also remind the sellers that brokers today are getting away with stealing clients’ money. Banks are also changing their deposit rules so if they start going under, they can steal depositors’ money. The truth is, if you are sitting on a lot of cash, you are a target to both governments and banks. If a seller wants to retire, there is no better way than secure, passive income. With you making him payments, he has the security of passive income backed up by the park. He can’t lose even if you don’t pay. If he’s worried about the repossession process, you can add a clause in your contract that makes that process easier and faster to ease his concerns. Usually, a seller who wants cash at closing wants to pay off some other debt. Just find out how much he needs and structure your deal to get him that at closing. Perhaps a 50% first from a bank will do that and he can carry the other 50%. Or, if he can finance the entire sale himself but wants the cash sooner, offer a 5-year balloon payment. That gives you 5 years to increase the park’s value before you refinance and pay off the seller. You get into the deal, and the seller sees he gets all his money within 5 years. Finally, if the seller wants to sell the park, most buyers will need financing to get it. This requires an appraisal. Banks will only loan a percentage (usually up to 70%) of the appraised value. If the seller’s books are weak or profits are weak, the appraisal will come in low and a buyer won’t be able to fund the gap. If the seller offers financing himself, no appraisal is needed, which avoids all those banker hoops and makes the deal much more certain to close — and to close much faster. So if sellers want to sell, they’ll have far more potential buyers if they can keep banks out of the deal. This is done by sellers carrying the note. As long as you convince the seller you will run his park well (you own 2 parks now so you have great credibility) and make your payments, he’ll be more flexible. It also helps if he likes you. Bonding with the seller is a must! This can’t happen going through a Realtor only. You must meet and speak with the seller to increase your chances of getting owner financing. You say brokers are getting away with stealing people’s money. I am currently working with a broker to purchase an rv park and she does seem a bit sketchy. How do they steal money? I meant stock brokers not real estate brokers. But anyone you deposit money with can fail to deliver what was promised or steal your money on deposit. Just make sure you keep all records and signed receipts for any deposits you made. Also directly ask for a list of all property disclosures. Anything negative a broker or seller knows about the property MUST be disclosed to the buyer before they buy the property. If they withhold negative info about the property you can sue them after learning about it to get your money and expenses back. Finally, listen to your gut. If you’re uneasy with that broker, you can say so and sever the relationship and start over with a new broker as long as you haven’t signed or promised anything to the existing broker. I just recently moved into a mobile home park (July 2013) and currently they have about the same amount of empty homes as they do ones that are filled. It has about 25-30 homes and I live in one of the newest ones. I want to purchase this park and I read your documentation on this page about lease option. The park needs to be dressed up and I want to increase the lot rent from 240 to 250 in order to include the keeping of the grounds. I have so many ideas to try and improve the number of residents and involve the ones that already live here but I would like some input from someone who has a mutual interest in this idea. I want to start community meetings once a month, I want to have womens group get togethers and mens get togethers. I want to have a monthly community dinner, I want to have a 4th of July community get together, I want to incorporate the talents of the current park residents to update the empty homes by giving them a discount on their lot rent, I want to put into place child care services with in the park, a doggie day care, I want to have a rec building put in place for the gatherings and a park area for the kids to play in because there is nothing for them to do here. I have so many ideas Mike and I would really appreciate your input for the best way to finance those extra charges with out increasing the cost of the lot rent. The vast majority of residents here are either on disability or government assistance. I don’t want to give handouts but hand ups. If I can involve the residents for services needed here in the park and discount their lot rent as payment, would that be advantageous to my vision or detrimental? Thank you for your input and your time. I want to make this a community that people want to live in and that I would have a waiting list for residents. Am I too far out there? It sure sounds like you have energy and vision! Your ideas about community-building activities will be as successful as the quality of the gatherings and the quality of the people in the community. If I read this right, the park sounds like it has about 30 units. That is still a small number of families to pull from. Statistically, the park and your plans will attract less than half the tenants. Perhaps your personality and energy can improve that. As for trading work for rent reductions, many landlords do that to some degree and some have success and some don’t. The potential downfalls are non-employees getting hurt doing your work (lawsuits), tenants’ work falling short of your standards or tenants just being too difficult to manage and you have to “fire” them, yet still live with them. Your heart is clearly in the right place and it is good you want to be an owner who wants the best for her customers, the tenants. I can tell you from experience that it is very fulfilling to provide clean, functional, affordable housing to people who really need it. Here’s my bottom line take on it. Buying or leasing the park is a great plan. If the park pencils out as profitable, your income can be assured for the rest of your life. But you’ll need a manager so the park will have to generate enough income to pay that expense. An existing tenant is your best option for manager because they live in the park (they’ll see problems early and better control them) and there is a potential to trade rent as part of the compensation. But make them an employee to stay legal and have workman’s compensation and unemployment insurance. You can manage the park for the first 6 months to learn the ropes, but if you do it longer, you’ll burn out and soon resent owning the park. Real inflation is running nearly 10% (ShadowStats.com) so you’ll need to raise rents every year as close to that as possible or you’ll end up unprofitable. If you aren’t making money, you can’t keep up the park and everyone suffers. So in my opinion, buy the park at the best price you can and operate it as fairly as possible and make it as nice as possible for the tenants. But profit must come first or nothing else is possible. Being a landlord will expose you to the best and worst in people. If you lead with your heart, you’re sure to be betrayed. It is good to work with people if they do what they promise but you have to limit it or you’ll lose. I allow tenants to pay late and waive late fees IF they let me know their plan in writing with exact dates of when I’ll be paid and how much. I don’t allow them to carry a balance into the following month because when I have in the past, the collecting of that money frequently fails. If they fulfill their promises, I work with them. If they don’t, they have to pay in full or move out. I think your best bet to fill the empty homes is to sell them for payments to new tenants so you gain lot rent and a trailer payment (Lonnie deals). Or, if the vacant trailers are in bad shape, sell them for $100 just to get an owner who will fix up the home and pay you lot rent. You’ll be helping people get into a home cheap and gaining an owner who should have pride to fix it and keep it looking good. You’ll gain income so you can keep up the park and implement some of your community-building ideas. I have several parcels in San Bernardino and Kern County California. Is it easy to develop a mobile Park? How much should I prepare for it? Around 25 acres. You’ll have more-than-normal regulatory hoops to leap through in California to gain approval. Then after completing the park you’ll get to celebrate with a 100% vacancy rate. Then the marketing begins. There are far fewer banks willing to finance new mobile homes and far fewer buyers able to qualify for those loans. So it’ll be tough sledding. Even if you decided to allow used homes in your new park, it’s very difficult for buyers to find anyone willing to finance those. There are very few mobile home resident/cash-buyers. And moving a used home can cost up to $10K once you consider unhooking utilities, moving it, re-leveling and re-hooking utilities, buying new skirting and building a new deck. $10K is more than many used homes are worth. I’m adding 4 lots to one of my parks now and it took several years to gain approval and is costing far more than I estimated. On the upside, my park’s value will go up about 10 times the increased annual net operating income so it will pay off. But the hassle factor has been quite high. I can’t imagine doing it without the already-existing income from the rest of the park. In my opinion, you’d be better off selling the 25 acres and using the money to buy an existing mobile home park. You’ll get far more bang for your buck, avoid all the development headaches and step into an immediate, existing income stream. Then, after you stabilize that park, if you still have the itch to develop, you can add lots to that park. No one chating on here no more. Mike you sure no you’re stuff ‘ great job! Thanks Harry. I check here regularly to answer any questions or comments. Hi Mike, did you present a written business plan? Is that necessary, especially if the park is in foreclosure and the bank is who we may be dealing with? And should we include resumes and/or a letter of getting to know us? We want to do this with no money down/seller financing. It is listed as Seller Financing or Lease/Purchase may be available to qualified buyers/Lessees with 30-35% cash down payment. Any input is greatly appreciated! Love your info! I did not submit a business plan for my parks as they were already operating and proven. I did tell the bankers as much detail as they wanted about what we planned to do to maximize our income. I would definitely include resumes and a concise bio for the banker. Anything that helps convince them you can run the property well and will make your payments is good. They are evaluating your character. Because the bank is foreclosing, they should be more flexible about getting you into the deal. The bank or seller should also be able to provide the bank statements which will give you proof of deposits and expenses. Most banks are going to want 25% to 30% down. But if you get some seller finance, you can lower that. Also, with a foreclosure, you may be able to lower it further. Perhaps they’ll agree to no down if the property is really not wanted by the bank and the seller finances 25% or 30%. The bank is also going to need the property appraised and they’ll only loan a percentage (usually 70 to 75%) of the appraised value. They don’t like being in deeper in case they get the park back. That’s where the seller helps you close this gap with owner finance. Banks also evaluate the collateral (the park), your credit score, the park’s cash flow and your capital (net worth). The better you make all these “C’s” look, the better your chance for the loan. Finally, it’s a good idea to shop some other banks before speaking with the bank handling the foreclosure. You’ll learn the prevailing interest rates, loan lengths, loan-to-value and down payment requirements in the market. You’ll also gain experience asking commercial bankers questions and practice talking to bankers before you speak to the main bank, which seems most likely to fund the deal. If the down payment requirements prevent you from an outright purchase, that’s when you consider leasing the park with an option to buy it for an agreed upon price in the future. If you negotiate well, a portion of your monthly rent can be applied to that future purchase down payment. Then over time, your down payment problem gets less and less each month, hopefully providing all you need by the time of purchase. I am currently looking in to a small park in a rural area just 2 miles from convenience retail (groceries, restaurants, etc.) and only 10 miles from a major employer. Currently permitted for 9 spaces; though zoned for 22 (would need septic for the 13 additional units). Park is underperforming with only 7 spaces rented, but has county water system and 5.8 acres of land. Seems like sale price should be based on current income from the 7 spaces, right? One question is approximate development cost per space cost for the final 13 spaces (septic, and utilities to pad site). I need to talk to local contractors, but the big cost would be septic, especially if one large system. The 13 spaces would be developed on basically “free land,” so cost would be the development cost (engineering, permits and construction). Congrats for shopping for parks. Yes, the price should be based on the current income, not on the potential income. I would not pay more than 10 times annual net operating income and maybe far less if the park has appearance or tenant problems. I’d only consider it if it makes enough monthly income right now to make it worth your while. Potential is often harder to harvest than it appears. Smaller parks have more problems because you have a smaller base of rents coming in. One or two vacancies or late payers or evictions can devastate your income. I like to buy over 30 lots if the park includes park-owned homes and over 50 lots if the park is only renting lots with no homes owned. The higher your rent streams, the less vacancies, evictions and late payers affect you. These larger parks also reward you with $5K per month or more profit plus faster and bigger equity appreciation. In short, they make your effort and attention worthwhile. I have found developing lots expensive and time consuming. It is also getting harder to attract trailers to your spaces. There are fewer decent used trailers available and fewer people giving loans on newer trailers. Owning the trailers yourself is also far more work with repairs and more tenant turnover. People who own their trailer find it expensive to move, so rarely do. Many variable costs on developing the lots. But if it requires engineering, dirt work, burying utilities, a septic field or multiple septic fields, then the electrical boxes and meters, gas line meters, water line meters and the fees to hook them all up, can easily run up to $20K per lot. More lots reduces this a little. Doing your own dirt work and utility burying can cut this in half. But of course, you’d have to already be skilled in that, no learning on the job. If it was me, I’d invest my time in a larger, already developed park to maximize your income and success. It is far easier trying to convince one seller of a bigger park to give you more owner financing so you can get a bank to finance the rest, than it is to do all that risky and expensive developing and then have to find and convince multiple strangers to move their trailer into your park. Very new to researching purchasing mobile home parks. Looking at park with 100+ lots , 95% owner occupied. The property has city water but a lagoon system for sewer. I noticed earlier you said that parks with city water and sewer should only be considered. Would the lagoon system be a deal breaker for you. The initial numbers show a purchase price right at 10x NOI and an occupancy rate of around 70%. The lagoon system isn’t necessarily a deal killer. Just learn all you can about it. How it’s monitored and maintained, it’s age, what it costs per month, what agencies inspect it and what paperwork is required. I’d also call the park’s plumber and ask him what service calls he’s had on it. I’d also add something in the offer letter that requires the owner to certify that the sewer system is working perfectly and he knows of no problems with it. You can also use the sewer system as a reason to offer less than asking price as it takes more care and attention. The 70% occupancy rate isn’t a concern if the park will still earn you good income as is. Don’t pay any extra for potential because if you fill those spaces, it’ll be due to your work so you should get that reward. I’d find out why it only has 70%. Was it once 100% and now declining (find out why!) or was it never full and is still filling over time? The 30% is all potential new income. Extended stay RVs (more than one month) may be easier to attract than permanent homes. I was raised by my grandfather and he built an RV park from a 188 acre corn field. I was there as a youngster doing whatever my grandfather asked of me. I later worked as an assistant manager and took care of nearly all of the grounds maintenance. I have always thought that owning and operating a mobile home park might be something I would enjoy doing in my later working years. I currently rent a lot in a seasonal park where I own the mobile home. There are 43 sites in the park and for the most part the current elderly owner basically only maintains the systems. We are on a well and on an onsite waste system. Each year there are issues that he must deal with related to keeping the aging systems usable. Aside from the streets and sidewalks needing some loving, my biggest concern would be dealing with a conversion to municipal water and sewer. Both are currently available but quite a stretch from the park to the trunk lines. There is a good 1/4 mile drive from the main road back to the park. Can you get me heading in the right direction with regard to figuring out what it might take to make any conversion happen. I understand this is a huge undertaking for a park that produces only about $98,000.00 / yr in lot rent. I would like to get my ducks in a row at minimal investment before presenting the current owner with my offer to lease to own the park. Thanks in advance for our reply and especially for all of your past guidance and helpful insight into park ownership. I like hearing that you have past experience both working a park and living in one. A couple things are working against making that 43 unit park worth the effort. You say it’s seasonal, so that tells me it’s closed part of the year. It also sounds like it’s an RV park which requires more daily presence if it offers overnight stays. I prefer extended stay parks (30 days or longer) if I’m dealing with RVs because they require less owner and employee presence. I prefer mobile home parks because they require very little owner or employee presence. As for the sewer lines, a long run like that to city services may require a lift station as you likely can’t get enough slope to make gravity do the work. That likely means two pumps so they can alternate to extend their life and have backup in case one fails. A grinder is also a plus but you can avoid that with one tank that everything flows into. The solids will sink, the water will pump to the city line, and you can pump that solids tank every three months or so. When I installed this type of system 7 years ago, it ran about $300K. Installing a new treatment system onsite would’ve cost about $250K but I’d be under the gun to the EPA and DEQ forever to make sure what came out of the end of my system passed their regular inspections. Hooking to city sewer took that headache away. Water lines are easier because the pressure will push the water. So that should be far cheaper. Just digging and pipes. You can start by speaking to a local engineering firm and just ask them for a general range of what’s involved. They’ll likely give you 15 minutes of advice for free. Expenses on that $98K of income will likely eat up at least half that income. You’ll have a mortgage or lease payment in that. You want the park to produce at least $3K in profit a month to make it worthwhile. Rent increases and transferring utility costs to tenants over time can help increase that. If you were to buy the park, you’d want to add the water and sewer system upgrade expenses to the mortgage so you know they were taken care of up front. Worrying about water and sewer failing takes the fun out of park ownership pretty fast. The seller will have a tough time selling the park with those big problems hanging over his head. So he should sell at a big discount and consider it a payback for all the years he spent the rent money without updating those systems. You might also use your penciling out of this park as practice for other, larger, more profitable parks that don’t have these problems. If you drop your desire for this park, your world is open to any park, anywhere you want to live. Mike, sorry I was not clear on the type of park. It is a seasonal mobile home park. 99% occupied but lot rent is paid quarterly by every unit’s owner whether they are there at all or not. There are no empty lots. Turnover seems to be less than 5% or so annually but the park remains fully funded all year long. I have contacted the county engineer about the sewers and there is a low pressure line at the municipal roadway. Would you consider assessing the tenants / lot leasees for the sewer and muni water install via increased lot rents? I like my gut feel but I trust your input and judgement. I’m sorry for the delay, I just saw your last post. Yes, I’d be passing along as much of that water and sewer expense onto tenants over time as possible. The bill will be too large to pass it all along at once so you’ll have to determine what a fair monthly payment would be, based on what tenants can afford. This is typically a max of $20 to $30 a month. This would be designated as a water and sewer “base rate” fee. You’d continue it for as many years as it takes to repay your expense. I would just recommend that if you go through this much work for the park that you make sure the park generates enough income after all expenses to make it worth your while. Buying a larger park is not much harder than buying a smaller park so you might as well make sure the rewards are as large as possible. Thanks for the information,You definitely make it look so easy to manage MHP. We are looking to buy one park but the seller in not sharing all the expense reports and the rental lease aggrements. Though property looks good and it’s on septic tanks. Can you please suggest something for what to look for from seller. Experience makes things look easy but you have to jump in to gain the experience! I made plenty of mistakes and had to work hard at the beginning. Sometimes you encounter defective sellers. If they want to sell the property, they will provide what you request. If they don’t have the documents or never compiled them, you can use his check registers and bank statements and his assistance to rebuild the numbers. There is also the possibility that the seller doubts your ability to buy and you’re asking him for too much information, too soon. Due diligence to verify rents (Like reviewing lease agreements) is usually conducted after you have both signed a purchase agreement. My purchase offers usually have the “outs” of being able to secure financing and being satisfied with the results of my 30-day due diligence period research. The seller may be thinking that without a purchase agreement, he’s wasting his time chasing down your requests. You get the best and most flexible deals when you build great rapport with the seller. If you don’t have that, and can’t seem to build it, I’d move on to another property. My husband and I are looking at purchasing an RV park in Colorado. The park at which we are looking is 10 acres with river frontage, 70 total sites, including 9 cabins/park models, and it’s on the edge of town so is on city water and sewer. It also has a log home and workshop/garage on the property, which the owners want to sell with the Park (this is currently their residence). We would probably look to rent the house out as a vacation rental or even on a longer term basis for the first few years in order to make that part of the property income-producing, along with the Park itself. The price tag is $3.5M, and the owners, who are in their 80s and so have aged out, will finance $2.5M with a $1M down payment. The problem is, we don’t have $1M to put down. We would sell our house and so have some skin in the game, but probably only about $100K after paying off our mortgage. Do you have any suggestions for some possible options for us? That high level of owner finance will make the deal look much sweeter to local banks because it greatly reduces their risk. Assuming the park appraises at $3.5M, local banks typically lend 70% to 75% of appraised value. If you were to just ask for 50% from the local bank, they’d likely think your $100K would be enough skin in the game. The bank will require first position on the loan so the seller would need to agree to that. But with only 50% risk, the bank knows if the loan fails, they’ll be able to sell and recoup their money. The seller would then get $1.75M (plus your $100K) at closing, which is far more than the $1M he wants now. You could also ask the bank for just $1M (They’ll still likely want first position) which would make bank qualification even easier. I’d also ask the seller what he plans to do with the $1M. If it’s not a desperate need, he might finance more or all, if he likes you and wants you to buy his park. You might also offer him a portion of the $1M down payment over time — quarterly or annually or with a balloon payment after 5 years. After 5 years, the park hopefully will appraise higher so you can refinance and be able to pay off the seller. As a final thought, for that price, make sure the annual net operating income (NOI) (Income minus all expenses except mortgage) is about a tenth of the asking price. More than a tenth is better. PS: RV parks take more active, daily work than permanent mobile home parks so the sales price should be closer to, or under, five times annual NOI. Lower than that is better. Extended-stay RV parks are easier to run than one-night-at-a-time RV parks. A 212 site Manufactured Home and RV Park. The park is approximately 84.2 percent occupied. However, the seller has been aggressively filling the vacant homes/lots and has targeted a 90 percent occupancy by the time a new owner takes over. The park has public water, sewer and electric which is all sub-metered to the tenants and has a current lot rent of $325.00 per month. The current owner has brought in 26 Modular Duplex units that have been achieving $550-$650 per month. Currently 49 of the 56 sides are occupied. They also have another 19 Rentals, 21 FEMA Homes (?) and 12 RV Sites occupied. The Rental Homes are producing $5,125/month. At the asking price of $6,350,000 a new owner can expect a Year 1 Cap Rate of 8.58%. Your thoughts on the provided #’s? When I look at deals I assume 100% financing to see how the deal stacks up with the largest possible mortgage payment(s). In this case, $6.35M at 5.5% over 240 months equals $524,170 per year. Subtract this from the NOI and you are earning $20,954 per year or just $1,716 per month. You’ll want to take a $30 rent increase the first month after closing. Using your occupancy rate it looks like you have 178 units paying rent now. 178 X $30 = $5,340 per month. Add that to the $1,716 you start with and you’re earning $7,056 per month or $84,672 per year. This will increase more if you are putting money into the deal. You’ll want to take a $10 or $20 rent increase every year to stay close to offsetting inflation, preferably on Jan 1. The good news with so many units is that a small rent increase to them equals a big increase for you. This assumes the seller has accurate expenses and no deferred maintenance. Sometimes, a seller will defer maintenance the year before he sells to make the NOI higher, which makes the park look like it’s worth more. So I’d take a close look at all the park-owned homes to determine their condition. Park-owned homes greatly increase the amount of work needed to maintain the park. More repairs, more tenants moving in and out and more possible vacancies. I like to see at least a 10% cap rate for a park with so many park-owned homes to reward me for the extra work. I think you’ll have an advantage negotiating this price lower due to that and due to the $6M price. Not many people are able to qualify for that level of purchase. I’d also negotiate as much owner finance as possible. The less the bank has to loan you, the happier they are to make the loan. I like financing rather than buying with cash because it’s a great inflation hedge. REAL inflation is running about 10% (ShadowStats.com) so a 5.5% loan allows you to repay the debt with cheaper and cheaper dollars every year, giving you a 4.5% “gain” every year. I’d also check the area for good employers, a strong economy and population gains. I’d speak to the police to see how many calls they had from the park in the past year and if you have any rough characters. Finally, I’d try to verify the quality of existing tenants by number of late payers and how far behind and how neat they keep their lots. The owner is asking $860,000 and says the park WAS bringing in $20,000 plus per month. The park is located on prime real estate right off a major, heavily traveled highway. The owner is willing to owner finance at 5%. My question is, the park needs several upgrades. Some of the mobile homes are no good. Some can be fixed. To properly run this park efficiently, we feel we would need to take a loan out for at least $200,000 to perform upgrades and purchase a few homes for the empty lots. We also have a big concern about the lagoon and whether or not it needs work or to be replaced. The elderly man who once ran the park is deceased. The park has really gone downhill since his passing as he did all the maintenance and up keeping of the property. The owners are VERY particular on who they sell the park to. They’ve had a few people interested in buying the park but refused to sell. The owner’s daughter (our contact source) really likes my husbands vision and will not offer the park to anyone else but us. Any suggestions? Do you think a bank would finance us the $200,000 to fix the park?